Sowing and Reaping – Whether Intentional and Random Wisdom is Needed! Everything we say and do is investment deposited in the lives of others. The outcome will always be a reflection of the seeds sown whether intentional or random. 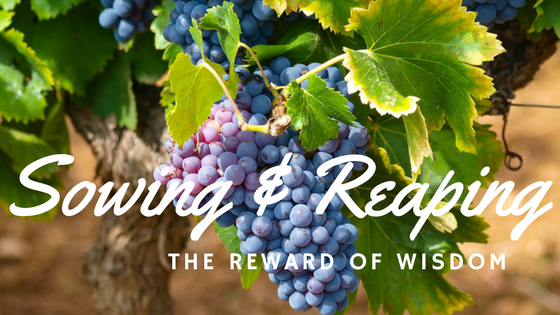 Let us carefully consider the principle of sowing and reaping approaching it with wisdom. For much of my life I paid little attention to this process. The seeds I was sowing were not always beneficial! A quick cutting word, impatience, sarcasm, selfish use of resources and relationships. My list of less than desirable seed is longer than I would like to include. I’m ashamed to say that it took me too long to see the connection between my words and actions with the resulting outcomes. By then I had a lot of unfavourable “weeds” to pull and burn from my life. Unfortunately, my poor seed choices effected not just me but everyone in my life! Though I have been diligent in recent years, that infestation of bad habits and patterns is not easy to uproot! In 1874 a member of the New York State Prison Board noticed that six members of the same family were incarcerated at the same time. The board did some research tracing the family line back to an ancestor born in 1720. He was considered lazy and godless, an alcoholic of “low moral character”. Marrying a woman who was much like himself, they had six daughters and two sons. To top it off the state had spent $1.5 million to care for this line of descendants, and non had made a significant contribution to society. But the opposite is also true! In contrast, another family who lived in the same era was studied. This second family study began with the famous preacher Jonathan Edwards, who was born in 1703. He lived a life of strong moral values and became a minister and a dedicated family man. and it always produces fruit. A wise person plants the best quality seed they have available – seed tested and chosen carefully. that have been confirmed by many reliable witnesses. Paul is talking to Timothy reminding him of the investment of time and truth deposited into his own life. He challenges Timothy to be faithful and plant these same seeds into the lives of others, who will in turn invest into yet others. Seed produces! The harvest, though not immediate or guaranteed, exceeds the measure invested. The process is be perpetual! Consider these verses of sowing and reaping! No matter how much time is behind you or what your past has been. Today is a new day! It is never too late to begin to invest intentionally in your life and the lives of those around. Even if there has been a season of discipline in your life, take hope! Don’t be discouraged by poor crops you may have reaped from in the past. There is better harvests awaiting you! will get a small crop. From this day forward, begin a journey a sowing wisely and generously! Just wait and see what kind of abundant harvest awaits!